At full stretch: Britain's Andy Murray hits a forehand return in his first round match against Spain's Roberto Bautista Agut. It was incredible, thank you so, so much to everyone that came out tonight. I’ve loved playing here over the years, it’s an amazing place to play tennis. If this was my last match, an amazing match to end. Murray’s hopes were not high given the state of his right hip but this was a remarkable performance for a man who admits he struggles to put his shoes and socks on. A kinder draw and Murray might well have delayed the seemingly inevitable but Bautista Agut is one of the fittest and grittiest players on tour, and he fought off the Scot’s comeback. 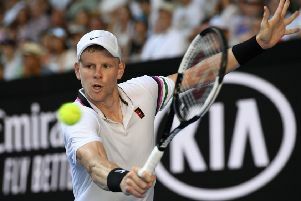 Murray’s voice was wavering as he began his on-court interview with his former coach Mark Petchey. “I think I’m going to be all right,” he said with a smile. “It was incredible, thank you so, so much to everyone that came out tonight. I’ve loved playing here over the years, it’s an amazing place to play tennis. If this was my last match, an amazing match to end. “I gave literally everything I had. It wasn’t enough tonight so congratulations to Roberto and his team. I don’t really have anything else to say but thanks to everyone, my team, my family, and everyone that’s contributed to my tennis career. 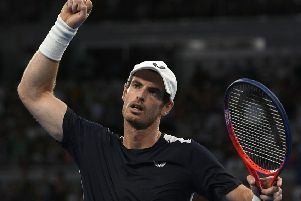 If that was an indication this was far from just another match, the early stages were encouraging, with Murray moving much better than he had in Thursday’s practice match against Novak Djokovic that set the alarm bells jangling. The Spaniard took the first set after breaking at 4-4 and Murray’s chuntering to himself was a reminder that he still very much wanted to win a tennis match. Murray roared in delight and defiance, his fighter’s instinct drowning out the pain. That was echoed by the Scot’s surgeon, and Murray may well choose to have a second operation straight away to improve his quality of life.